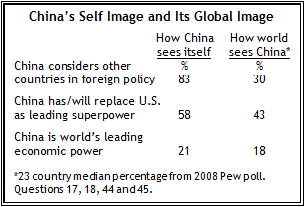 The Chinese generally have a positive view of their country’s role in world affairs. They see their country as well-liked abroad and believe China considers the interests of others in making decisions about foreign policy. They also see their country on the rise – most think China will ultimately supplant the United States as the world’s leading superpower. Chinese views toward some of their country’s key international competitors are largely negative. In particular, positive ratings for Japan are scarce, and the U.S. and India also receive largely negative reviews. Relatively few Chinese name the U.S., India, or Japan as a partner of their country, and many consider them enemies. Overwhelmingly, the Chinese believe their country enjoys international popularity. 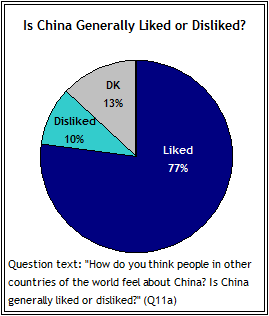 Fully 77% of those surveyed say people in other countries generally like China – a significant increase from the 68% who expressed this view in Pew’s 2005 poll. In fact, the current survey reveals mixed – and increasingly negative – international views of China. Majorities in only seven of 23 countries have a positive opinion of China, and in the 21 countries where trends from last year are available, China’s favorability rating has declined in nine, increased in only two, and remained basically the same in 10. A similar gap is seen between China’s self-perception and the views of other publics regarding China’s approach to international affairs. Slightly more than eight-in-ten (83%) Chinese think their country takes into account the interests of other nations when making foreign policy decisions, but in the other countries surveyed, relatively few believe China considers their interests. Across the 23 other nations in the poll, the median percentage saying China considers the interests of countries like theirs in its foreign policy decision making is only 30%. A somewhat smaller gap exists on the question of whether China will replace, or already has replaced, the United States as the world’s dominant superpower. Nearly six-in-ten Chinese (58%) think this has either already occurred or will in the future, compared with a median of 43% across the other 23 countries surveyed. Chinese views mirror public opinion elsewhere on the question of which country is currently the world’s leading economic power. In China, as well as in nearly every other nation polled, the U.S. is considered the dominant economic power. Still, in many countries a sizeable minority name China. The percentage of Chinese who see their own country in the top spot is 21%, just slightly more than the 23-country median of 18%. Most Chinese believe their country’s rapidly expanding economy is having an impact around the globe, and they largely see this as a positive development, not only for China itself, but the rest of the world. A clear majority (55%) thinks China’s economy is having a positive effect on the economies of other countries, while just 3% think it is hurting other countries. This view is especially common among the well-educated – 64% of those with a college education think China’s growing economy is a benefit to the rest of the world. 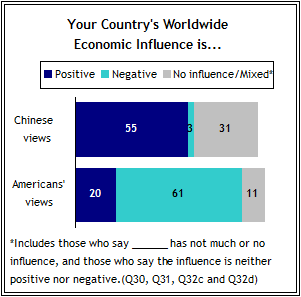 The way the Chinese people feel about the impact of their country’s economy contrasts sharply with the way Americans currently feel about theirs. About six-in-ten Americans (61%) think the U.S. economy is currently having a negative effect on the rest of the world, while just 20% say the impact is positive. Views of Japan, India, U.S. The longstanding historical animosity between China and Japan is clearly reflected in this survey. Only 21% of Chinese have a favorable view of Japan, while 69% have an unfavorable opinion. Nearly four-in-ten (38%) Chinese consider Japan an enemy, while just 11% think it is a partner, and 37% say it is neither. Men (42%) are somewhat more likely than women (35%) to identify Japan as an enemy. The extent to which these views are tied to the past is illuminated by the fact that 76% of Chinese do not think Japan has apologized sufficiently for its military actions during the 1930s and 1940s. Of course, China has had tensions with neighboring India in the past as well, including a brief border war in 1962. Chinese attitudes toward India are more positive than attitudes toward Japan – still, only 29% hold a favorable opinion of India, while 50% have a negative view. The Chinese public is split, however, over whether India is a partner (25%) or an enemy (24%). 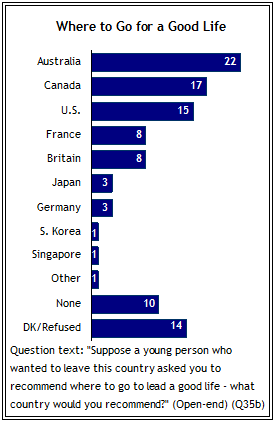 Favorable views of the United States are more common than positive views of Japan or India – 41% give the U.S. a favorable rating. However, only 13% see the U.S. as partner, while roughly a third (34%) consider the U.S. an enemy. Where Are Lands of Opportunity? There is no consensus among Chinese about where outside of China one can go to lead a good life. When respondents were asked to recommend a country where a young person could move to lead a good life, the most frequently cited countries are Australia (22%), Canada (17%), and the United States (15%). Several European countries make the list, including Britain (8%), France (8%) and Germany (3%). However, few recommend any of China’s Asian neighbors, such as Japan (3%), South Korea (1%) or Singapore (1%). Attitudes toward the U.S. are tied to perceptions of the ideal destination for a young person. Respondents who have a favorable opinion of the U.S. are twice as likely to recommend the U.S. as are those with an unfavorable opinion (23% vs. 10%). English has often been viewed as the language for business and trade, but the Chinese have begun to place less value on learning English in order to succeed in the world. While a majority of Chinese agree that “children need to learn English to succeed in the world today,” this percentage has dropped from 92% in 2002 to 77% in 2008. Moreover, they are now much less likely to completely agree – today, only one-third (33%) completely agree that children need to learn English, compared with two-thirds (66%) who did so in 2002. Wealthy Chinese are slightly more likely than low-income individuals (37% vs. 30%) to completely agree that children need to learn English, but among most demographic groups opinion on this issue is largely uniform. Indeed, men and women of all age groups are equally likely to agree on the need to learn English to succeed in today’s world. Moreover, education is not a factor in whether or not respondents agree on this issue, as opinion is equally strong across all educational levels.